Last night in bed, I rolled onto my back and the sudden pain jarred me out of deep sleep. Owwwwwww! I winced. RaeRae rustled next to me but didn't wake up. Trapeze class really did a number on my torso, I thought. I haven't been in this much pain since my car accident. Once I remembered the accident, I realized the date. 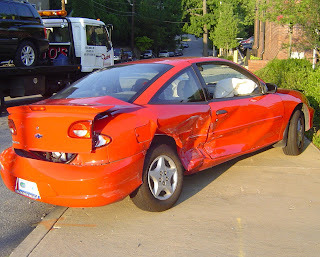 June 28, exactly three years to the day since two cars destroyed my sweet lil Chevy Cavalier. Three years since I told my old boss that I was leaving Atlanta and moving to the Big Apple. Three years since my life changed direction. CAR - I'd sell my car to my brother who'd just totaled his in an accident. JOB - I'd transfer to our New York office and work in the consumer practice, "my dream job." APARTMENT - I'd move in with my best friend in Hell's Kitchen. 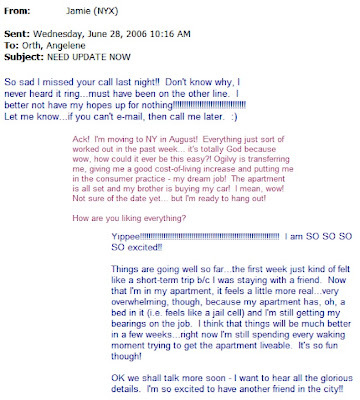 Two days after I announced my intentions and put all the wheels in motion to move to NYC, I had an email exchange with Jamie, who at the time was little more than a peripheral friend Buckhead Church small group. That was June 28, 2006. Well we all know what happened to the car - it met an untimely demise about 8 hours after the email convo with Jamie. And the transfer didn't work out, so I ended up moving without a job. The only thing that did go according to plan was moving to Hell's Kitchen.